We are a phenomenal Manufacturer, Supplier, and Exporter of Kitchen Slicer & Dicer. Our entity is based in Rajkot, Gujarat, India. It is sourced from the superior quality of raw materials and components. We adopt sophisticated techniques for crafting our Kitchen Slicer & Dicer. 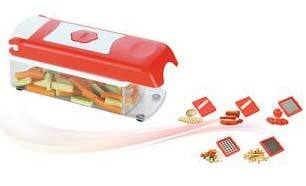 It is highly efficient in slicing and dicing all kinds of vegetables and fruits. We offer it to various hotels, restaurants, canteens, and kitchenware dealers. Our highly skilled professionals manufacture it with a high level of precision. We offer it at a highly reasonable price.